"This is a quick and delicious vegetable and noodle salad for any occasion." Break noodles and cook as directed on package. Drain and rinse noodles under cold water. 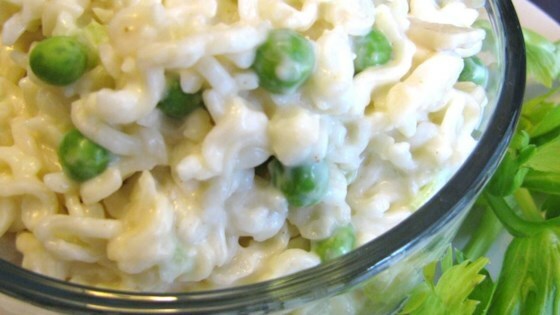 In a large bowl, combine the noodles, celery, water chestnuts, red onion, bell pepper and peas. Prepare the dressing by whisking together the mayonnaise and ramen noodle seasoning mix. Pour over noodle mixture and toss until well coated. Refrigerate until chilled and serve. Really great make-a-day-ahead salad - enjoyed by all ages. We added tiny shrimp and mixed red, yellow and green pepper for color. Well worth the time it takes to cut everything up! I made this to bring for X-mas. Everyone loved the refreshing taste of it. I doubled the recipe and unfortunately, the noodles were quite unruly to deal with. I will make it again for a party.